Have you ever heard the Caribbean sounds of the island while walking along the beach in Key West Florida? Do you or your company have plans to have a beach wedding, corporate event, or even a rehearsal dinner in Key west Florida? How about a visit to Stock Island, or even Sunset Key? This would be a great time to have the sounds of the steel drum band at your event. The amazing steel drum players can make your event a sensation. Their unique Caribbean sounds will be heard all throughout the sea of guests. Making your corporate event or beach wedding the talk of the year. The RythmTrail steel drum band can make any event spectacular. For the best in soca, calypso, reggae, or steel drum music call RythmTrail. Giving you a taste of Island music right at your tables. Enjoy great views, wonderful music, and sensational breezes you can’t experience anywhere else. You can have the song pick of the party, or even have them choose the right song for the mood. It is great for audiences of any age. And you can bet that with 20 plus years of musical experience it will be a night to remember. 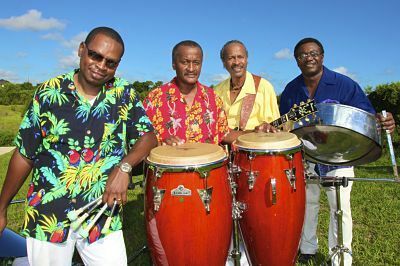 Steel Drum Band Reviews for event in Key West Florida area.